Every coffee house with a teaspoon full of business sense has a loyalty card these days. If you're a coffee shop owner and you don't have one - get with the programme slow-coach! This chap Gwilym is a World Barista Champion and has devised an ace concept to encourage people (namely his customers) to sample other coffee shop's wares in order to appreciate the superiority of his coffee. The way he does this is by giving out Disloyalty Cards. 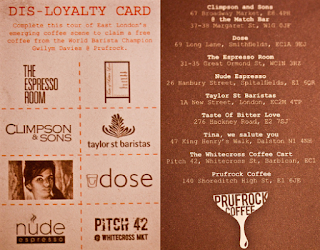 Every time you sample a coffee elsewhere you get a stamp in your disloyalty card. Once the card is fully stamped (eight coffees worth) you present it to Gwilym who will serve you up a delicious steaming coffee beverage of your choice.